“Creativity takes courage,”the French Fauvist painter Henri Matisse famously said. This is particularly true for property developers in growth-hungry but land-deprived Hong Kong. Artistic revitilisation, however, breathes new life into communities and properties. New narratives and purposes are created for the neighbourhoods, with initiatives that can range from curating art galleries, installations and workshops within a building such as H Queens, to an overhaul of an unused governmental or private complex like the PMQ. Hong Kong-listed New World Development (NWD) has taken the idea further by introducing the Artisanal Movement, the brainchild of Adrian Cheng Chi-kong, vice-chairman of, and third-generation heir to, the conglomerate. NWD calls it a “cultural vision”, a “philosophy of living” that even extends as far as a celebration of humanity. The movement, which is taglined “collect, connect, collide”, emphasises “making” as a way for a sustainable lifestyle to rekindle the artisan spirit within everyone. The movement has proved to be more than a whim of the Harvard-educated Cheng and is instead a “doctrine” that has laid down roots across NWD since Cheng was appointed executive director and joint general manager six years ago. As the curator of the Artisanal Movement, NWD advocates imagination, craftsmanship, heritage and contemporary values, and is on a mission to repaint Hong Kong’s sense of both “city” and “home”. It maintains that it tries to steer clear of “the cookie-cutter approach” so that each project can assimilate into its neighbourhood to embrace the flavours and customs unique to that district. One example is North Point’s Fleur Pavilia. Situated on Kai Yuen Street, the residential property features over 600 units priced from HK$17 million to HK$80 million. In an effort to create an oasis of calm away from the busy city, Fleur Pavilia employs the use of pine, bamboo and plum blossom so residents can immerse themselves in the philosophy of “Kazuaki Seishin” which, NWD explains, is an ideology based on respect, purity, harmony and tranquillity. Japanese interior designer Shigeru Uchida and landscape architect Ohtori Consultants have been engaged to realise this vision. For instance, a chashitsu, or tea room, adorned with calligraphy and Japanese flower arrangements has been set up in the complex for ceremonial gatherings. While the scarcity of land poses a challenge to projects that require well-structured space planning, NWD says it is a way to innovate and differentiate. Mixed-purpose residence Skypark in Mong Kok has introduced a clubhouse on the 28th floor with a connected sky garden to bring greenery and serenity to the busy neighbourhood. Residential buildings aside, the Victoria Dockside is the developer’s latest artisanal effort to reshape the Tsim Sha Tsui harbourside, home to the Space Museum, Cultural Centre and the soon-to-reopen Museum of Art. The area’s roots can be traced back to 1910, when it served as Holt’s Wharf, a godown terminal located at the southeastern tip of Tsim Sha Tsui that saw the city’s rise as an entrepôt. The site was sold to NWD in 1971, which eventually, in 2017, gave the area a new identity as Victoria Dockside. The project sets out to reinvigorate the waterfront with a three million-square-foot district, set to fully open in late 2019, which will be composed of class A office building K11 Atelier, museum-retail complex K11 Musea and the luxury serviced residence K11 Artus. Even amid the facelift, however, traces of the dockside’s old appearance have been retained in its new facade. For instance, the wood columns in the lobby of K11 Atelier are sourced from defunct piers, as a salute to the area’s maritime heritage. The architectural concept, defined by Kohn Pedersen Fox (KPF) Associates, is the convergence of nature and building aesthetics. “A key luxury is the office’s unusually large window bays: at 2.75 metres wide, tenants can bask in spectacular panoramas of Victoria Harbour,” says a KPF official. The public areas at the edge of the district are also being reinterpreted by New York-based urban architect James Corner and his team, who have been commissioned by the government to redesign the Avenue of Stars and Salisbury Garden into an area where people can stroll among art installations. 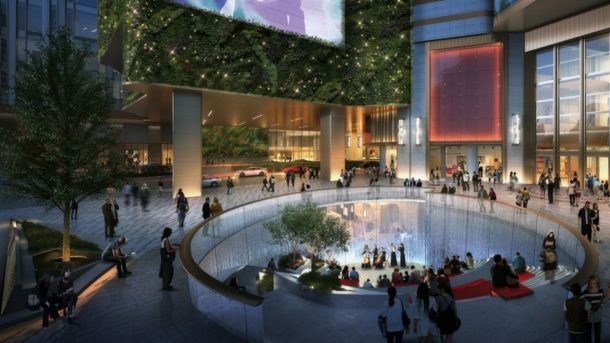 The US$2.6-billion development project has enlisted over 100 international designers, artists and architects to rewrite the area’s story with cultural programmes, experiential retail and rotating art collections. Another Kowloon project with a new story to tell is The Mills, Nan Fung Group’s landmark revitalisation of the Nan Fung cotton mill, which ceased operations in 2008 due to the demise of the cotton industry. The revamp of The Mills was launched in 2014, when rows of old machinery were replaced by incubators for start-ups and exhibitions showcasing the history of Hong Kong’s textile industry. Hints of the former factory interweave with the new complex, which is scheduled for a grand opening in March 2019, from the new logo featuring a looping strand of cotton to stencilled signs and steel reinforcements for columns. Supporting the new structure are three pillars: business incubator Fabrica, retail series Shopfloor, and art institution, the Centre for Heritage, Arts and Textile (CHAT). The first and only art institution in Hong Kong that specialises in textiles, CHAT aims to promote art through in-house curated programmes, including workshops and co-learning modules dedicated to the textile industry’s heritage, art and design, say co-directors Takahashi Mizuki and Teoh Chin Chin, both of whom graduated from the School of Oriental and African Studies at the University of London. Mizuki and Teoh hope The Mills and CHAT can bring together people from different walks of life to foster creativity and play a part in the evolution of the Tsuen Wan district. Seasonal programmes will be staged, with the focus on a dialogue between modern design with textile heritage. Contemporary collection shows in spring will challenge conventional ideas of textile art, while summer co-learning programmes invite communities to take part in art creation. The artist-in-residence programme, launched in 2015, encourages artists to collaborate with locals to foster the cross-cultural exchange of ideas. Japanese artist Yukihiro Taguchi wove a traditional fire dragon from fabric scraps and bamboo this summer, with the help of over 600 volunteers, most of them Tsuen Wan residents. The 35-metre “Spun Dragon”, consisting of 35 bamboo cubes of varying size, took three months to complete. Taguchi was CHAT’s resident artist in 2016. The baton has now passed to Philippines educator and cultural worker Alma Quinto, whose creation with CHAT will be unveiled during the winter pre-opening programme.